The Workspace Analysis of the test user (TestDesktop05) wasn’t very helpful, it showed a gap of 1 minute and 13 seconds between “Start preparing menus” and the next action (user setting sampling). 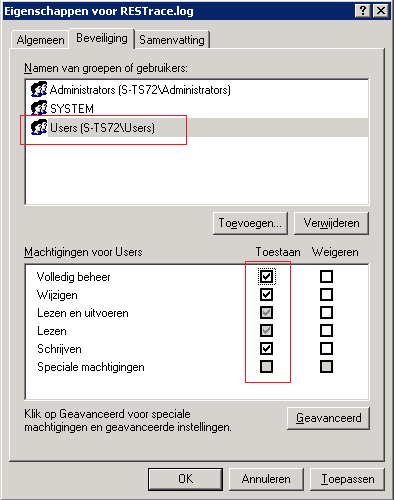 After enabling the RES trace file (see Q201489) and restarting the RES Workspace Manager Agent more detailed information was captured (don’t forget to give modify permissions to the test user on the trace file). 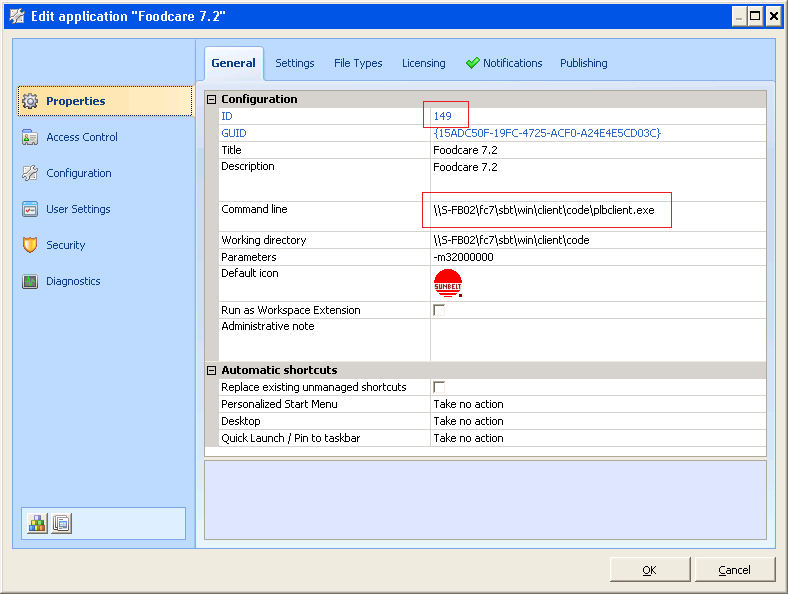 In the trace file the same gap was visible during the ‘RetrieveMenus; Checking app authentication’ phase in function ‘fysnAppAuthenticated’. Apparently the application with ID 149 and title ‘Foodcare 7.2’ caused the delay. 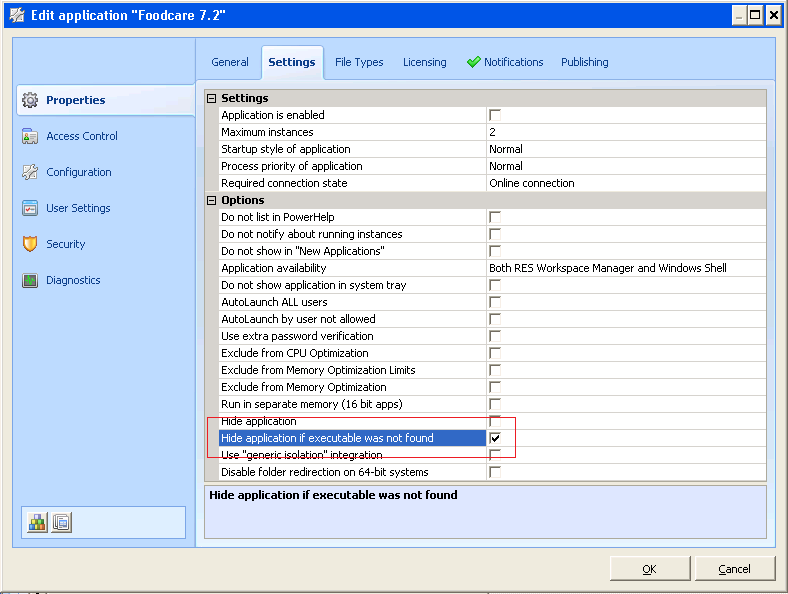 The properties of the application in the RES Workspace Manager Console show that the executable is stored on a network location (on server S-FB02) and that it should hide the application if the executable was not found. Resolving the name S-FB02 to an IP address is done via DNS, right after pwwsmgr.exe logged the application in the REStrace.log. The response was given in a few milliseconds and returned the ip address 172.22.30.46. Besides resolving the hostname of S-FB02 via DNS the system tries to resolve the name to an IP address via NBNS. The response was given within a few milliseconds by the WINS server (172.22.0.102) and returned the same IP address 172.22.30.46. The same request is sent via the pvs network (10.3.0.72) but never got a response. This is as expected, there is no WINS server and the S-FB02 machine is attached to the pvs network. After 46 seconds the request is repeated, apparently the system was satisfied. The system wasn’t satisfied because the IP address could not be translated to a Media Access Control (MAC) address. Since the IP address is on the same subnet it needs the MAC address to communicate to the NIC of the remote server (S-FB02). Translating the IP address to a MAC address is done via Address Resolution Protocol (ARP). Since it knows the IP address to resolve (172.22.30.46) is handled by the PRT1 LAN NIC (172.22.5.72) all requests are sent via the NIC with MAC address E8-39-35-BC-48-44 (where E8-39-35 is owned by the vendor Hewlett Packard). After sending 20 requests and getting no answer the system returns with an error: No network proivder accepted the given network path. The feature to hide an application if the executable does not exist is a nifty feature, it’s a great way of hiding shortcuts that would never word and irritate the user. It comes at a price though, especially if the executable is stored on a network location. Since the process of checking for executables is synchronous the user (potentially) needs to wait a long time. Additionally it adds some overhead on the network since it checks the existence of executable each time the users logs in or refreshes its workspace. This customer frequently disconnects and reconnects because they roam there session through the hospital. What adds to the frustration is the difficulty to troubleshoot the issue: there’s no indication why there’s a big delay. So here’s a feature request for RES: Please add a warning in the users’s event log (workspace analysis) so the admin knows what’s causing the delay.